theMALC: Colored Belts In Modern Martial Arts Or The "Rainbow Mudansha"
On the matter of colored belts many people continue to labor under the assumption that a colored belt, even a brown one, has any meaning in the Mudansha / Yudansha structure that was the precursor of the various belt systems used in today’s martial arts. As I noted in my previous article on this subject, traditionally, the graded ranks or Yudansha were the only obi color change for the Kodokan’s, the home school of Judo, uniforms. Jigoro Kano, the founder of Judo, developed this ranking system for his students. Yudansha wore black belts. All others wore a white belt. Here’s a historical note for Kenpoists, up until about 1968, Ed Parker’s Kenpo Karate’s belt ranking system was still white, brown, and black. Kenpo’s original colored belt rank structure of orange, purple, blue, green, brown, and black was developed around that time. 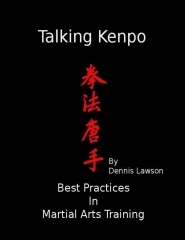 Around the mid 1970s, the Kenpo belt rank chart, which included the colored belts with stripes or half ranks, and the black belt ranks with red stripes to designate their rank, was first printed. This belt system was used to separate the 32 self-defense techniques required for each new belt rank, the green-orange techniques (Brown techniques) and the original extensions developed for brown to black belt. Many studios using this system, then and now, tested for the intermediate belt ranks or “tips”. Around 1970 the 10 original techniques for yellow belt were added to this structure. Some of us didn’t see these yellow techniques until years later. This arrangement, where curriculums are often broken down into specific requirements separated by colored belt ranks, has become the norm for most of the modern martial arts industry. Were the colored belts created to give students a symbol of their progress and create tangible short term goals? Were they created to add revenue by testing for belts? Testing for ranks aimed at a fee in the Mudansha / Yudansha had been common prior to the beginning of the 20th century based on Kano’s configuration for rank in his Kodokan, but the belt color did not change until the “graded” ranks. The new innovation was using colored belts, often with stripes to designate intermediate levels, to designate the “levels of ungraded ranks”. This gave students, especially Americans, something tangible for their testing dollars. One often hears complaints of “commercialism” against the Arts as they are taught in the modern era. The teaching of martial arts for personal gain has a long tradition. It was common in ancient China and Japan for wealthy warlords and heads of a clan to hire a martial arts “Master” to teach their families or retainers the arts of war or self protection. The unique contribution in the modern era is that innovators like Ed Parker along with many of his contemporaries, Ark Wong, Bruce Lee, Wally Jay on the mainland, and Henry Okazaki in Hawaii, were willing to teach the martial arts to anyone, regardless or race, creed, or color.